Established by Patricia Link in 2012, Parker Trace Farm is located in Georgetown, Kentucky. Specializing in the development and sale of quality off-the-track Thoroughbreds as hunter/jumper and eventing prospects. 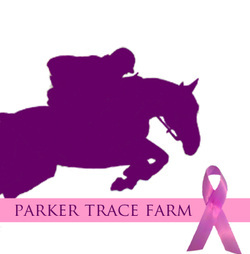 A portion of the proceeds from Parker Trace Farm's sales will be donated to breast cancer research for a cure. Congratulations to Parker Trace Farm on the successful sales of Always On, Robyn's Sapphire and Lola! 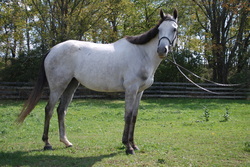 2009 Thoroughbred Mare. 16.0 Hands. JC registered, foaled March 17, 2009. She's only three, but showing great promise as a Hunter/Jumper, Equitation, Eventing or Dressage prospect. Balanced mover with lovely gaits and auto-changes. Extremely sweet, calm personality, she has very smooth gaits and auto changes and is already jumping small courses. 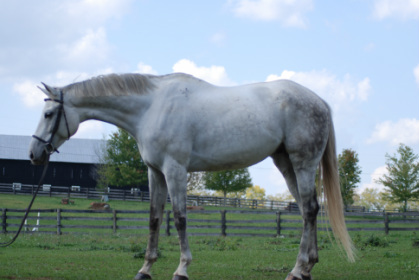 2006 Thoroughbred Gelding. 16.0 Hands. JC registered, foaled June 21, 2006. Excellent Jumper or Field Hunter Prospect. Bold and brave to fences, he is confidently jumping 2' to 2'6". He does require a confident, intermediate/advanced level rider.